The upcoming Memorial Day weekend marks the start of summer and the beginning of BBQ season. There’s no better way to kick things off than by spicing up the staple foods of summer. First up, burgers! The twist? Hold the beef. I know, I know. “Where’s the beef?” is not a question you expect to answer on the first weekend of summer, but it certainly doesn’t mean that you’ve done wrong. In fact, if you throw one of these burgers on the grill, I’d say that you’ve surely done something right. Very right. These burgers are what summer eats are all about: simply grilled food with big flavor that satisfies. So where’s the beef? Who cares! 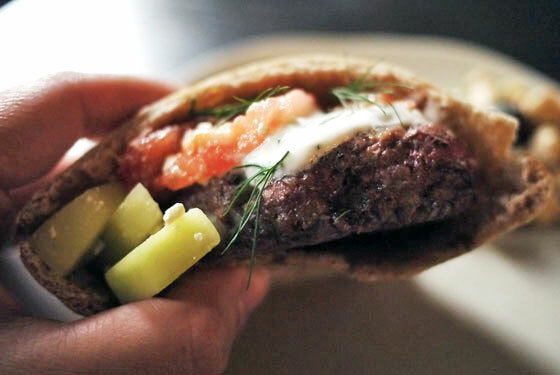 Ground lamb is a great, unexpected substitute for beef when making burgers. These Mediterranean-style Lamb Burgers with Yogurt Sauce make a festive meal served with picnic-perfect Greek salad and warmed pita bread. Go all out and skip the potato and macaroni salads for mezzes like hummus, pita chips and even stuffed grape leaves (which you can buy at your local international food store). Just don’t drink too much ouzo and start breaking plates! Turkey burgers are no longer just for the dieting set. The healthier burger is a great alternative for non-red meat eaters and health-minded omnivores, alike. And doesn’t that include most of us?! )The secret to a good turkey burger is keeping the meat moist (don’t overcook them!) and flavorful. In the case of these crazy good Herbed Turkey Burgers, the flavor secret is tons of freshly chopped herbs. Delicious! Vegetarian? No problem. You can still enjoy burgers. You can even experiment with them. Skip the prepackaged veggie variety for these Quinoa Parmesan Burgers. If you want to get fancy, you can even throw in some chopped chives and other fresh herbs. If you don’t have Parmesan—or want something with more bite—try substituting extra sharp cheddar or gruyere. Then watch the carnivores come around. Don’t wait until you’re totally sick of burgers to start changing things up. Do it now! Kick off summer with great flavor and the spirit of adventure. Beacuse you can ditch the beef and have your burger, too.